Day 2 of the Cuisine & Wine Asia dim sum marathon brought us to Wan Hao at The Singapore Marriott Hotel. 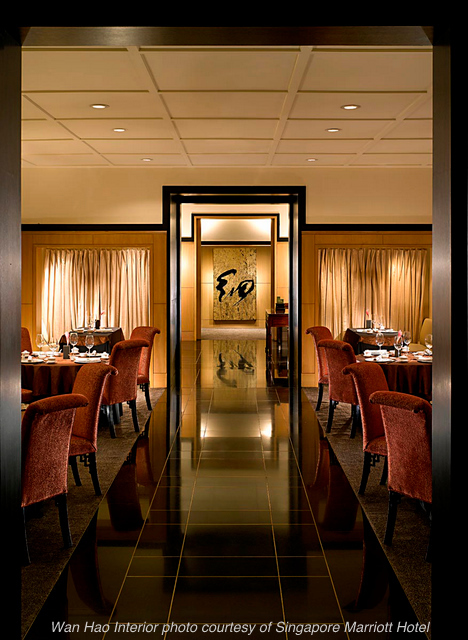 Tucked away discreetly on the third level, this traditional Cantonese restaurant is beautifully posh, with gold leaf calligraphy and plush seating. 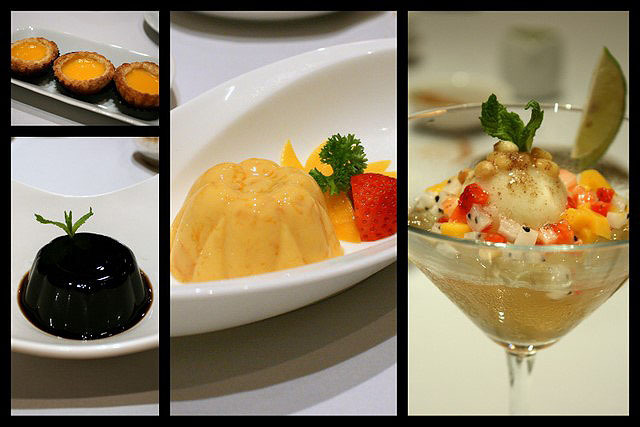 For this session, Wan Hao served up 31 out of the 70 dishes available from its weekend dim sum a la carte buffet. Brad of Ladyironchef and I had little over an hour to photograph, taste and evaluate everything. It was like the Amazing Race! Rushing from one dish to another, making sure we covered all stops. It's a gorgeous spread, so let's get on with the food. Appetisers first. Jellyfish with Cucumber. I love jellyfish. It's a brave soul whoever first sunk teeth into this crunchy sea creature and discovered it edible. But thank god that person did. Jellyfish is such a textural delight. This was a nicely marinated salad, well-tossed with sesame seeds, savoury bits (dried shrimp?) and cucumber juliennes. Served refreshingly cold. The Roast Pork Belly is superb. A good cut of meat, evenly roasted and seasoned. Not overly fatty either, as you can see. Just nice. My favourite part is the crackling skin. The Roast Duck is also notably good. I'm not even a fan of duck and I enjoyed this. Moist, tender and tasty - it didn't even need any sauce or accompaniment. 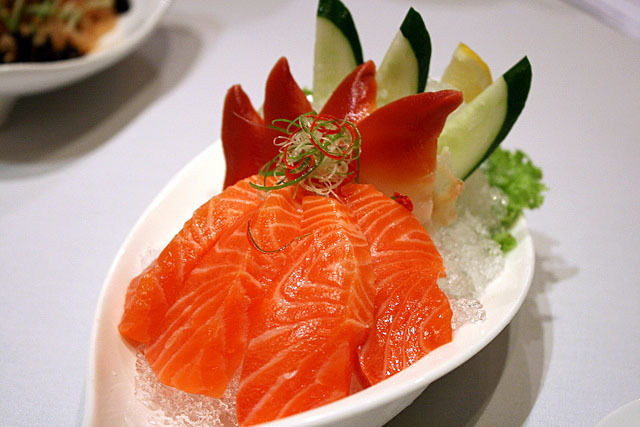 Salmon and Hokkigai Sashimi. The sashimi is some of the brightest I've ever seen. No, don't adjust your monitor, it really is that colour. I didn't use any saturation post-processing either. Served thoughtfully on a bed of ice, the sashimi stayed fresh and cold while we took our shots of the other food. Yes, we were supposed to be there for dim sum. 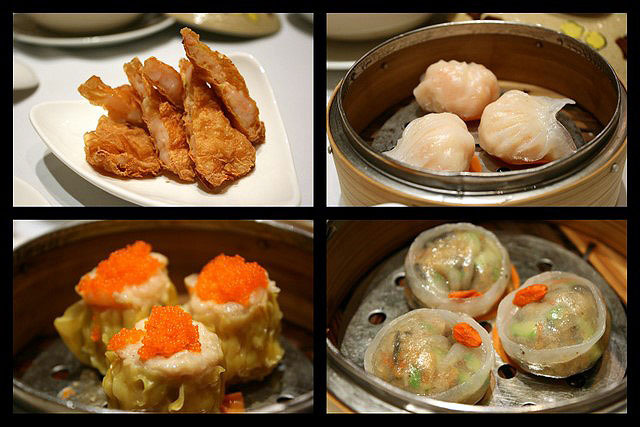 There were only five dim sum items presented (out of 12 in the menu), but all well-executed. Beancurd sheet filled with shrimps (top left) - crackling good. The har gau (shrimp dumpling; top right) and siew mai (minced pork dumpling topped very generously with fish roe; bottom left) are very safe, traditional renditions. Some may find this unexciting, but there's innovation in other items like the asparagus dumpling (bottom right). I liked that one. 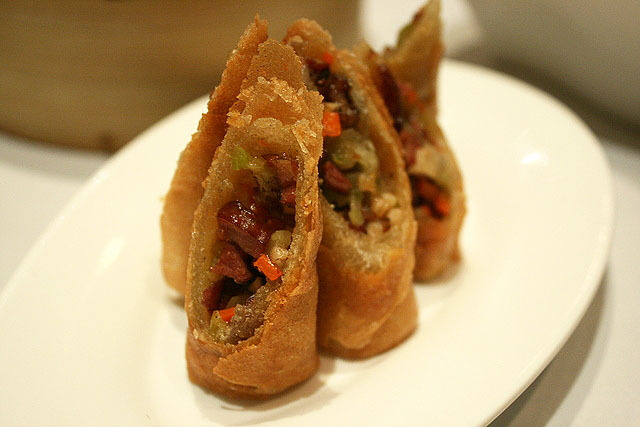 Spring Roll with Smoked Duck. 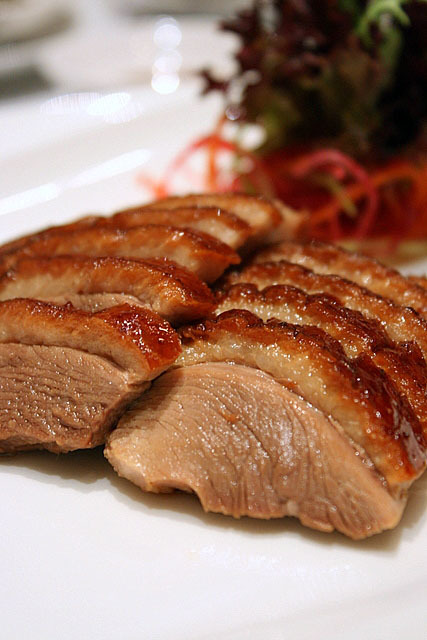 The tiny pieces of smoked duck packed a punch in the flavour department! Very clever addition. 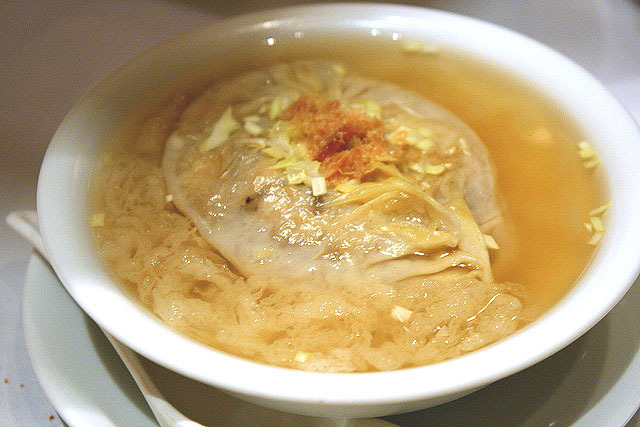 Shark's Fin Dumpling Soup. 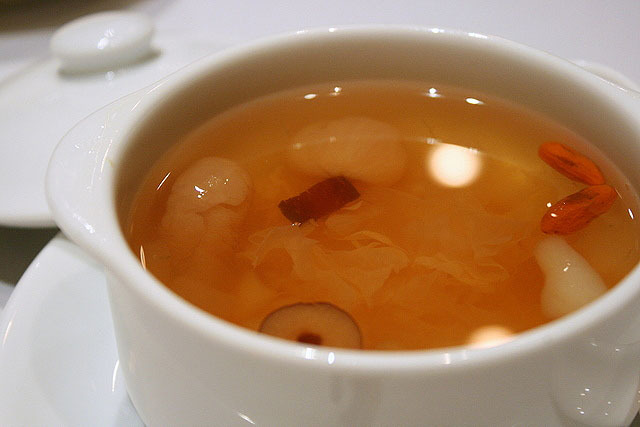 Wan Hao gives you four choices of shark's fin - others include shark's fin with dried fish maw, shark bone consomme with fish maw, and the last one is below. But yes, there is a caveat - only one order per table. Remember that sharks are high in methyl mercury content - so eat wisely, especially if you are pregnant, or a small child. I love shark's fin, but reports of finning and overfishing are disturbing. So I don't order but I don't waste either. I will eat it if it's already cooked and served. Heck, even the Dalai Lama will eat meat that's cooked and served to him (unless the animal is specifically killed in his honour). 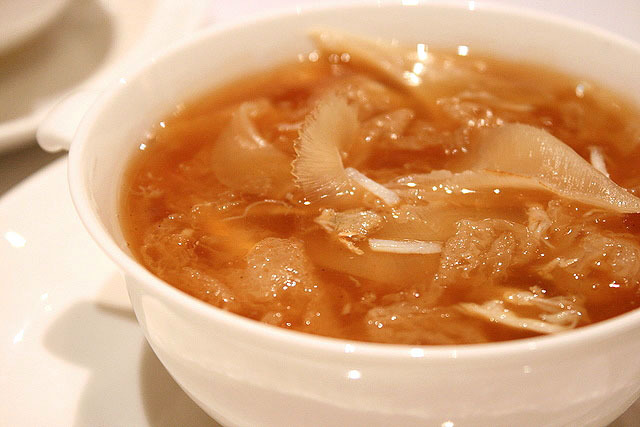 Shark's Fin with Crabmeat and Bamboo Pith - chockful of ingredients! Sorry I can't seem to get the colours absolutely right (the cosy lighting proved challenging in the all-enclosed private dining room). Top row (left to right): Garoupa with century egg (first time I've seen century egg used in soup); Wintermelon with conpoy; Seaweed beancurd with conpoy and abalone. 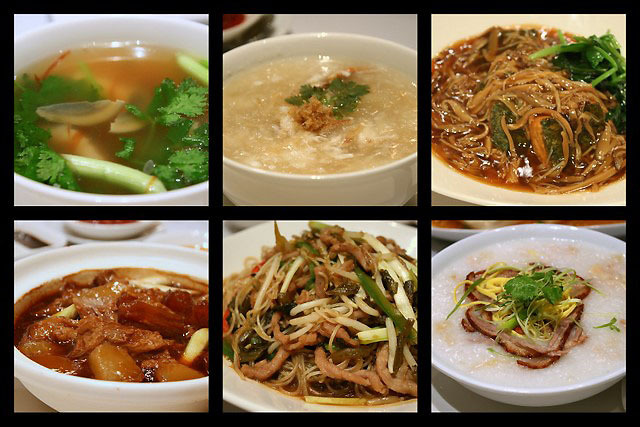 Bottom row (left to right): Beef tendon with white radish, Vermicelli with pork fillet; Congee with sliced fish maw, squid, fish, peanuts, duck meat and jellyfish. I realise too late that I missed out on taking a shot of the ee-fu noodles. Fortunately Brad has a delicious photo of it - check out his post here. The ee-fu noodles were done beautifully. Well-coated but not wet. Smooth but not oily. More importantly, the noodles retained some bite, unlike the overcooked soggy mess that so many restaurants tend to proffer. Seven Spices Sea Perch Fillet. 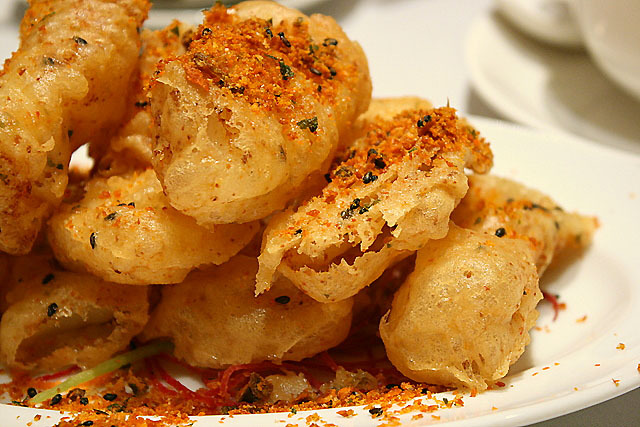 Boneless fish in crisp, light batter. The "seven spices" looked and sounded a lot like the Japanese shichimi togarashi, but apparently the chef concocted his own mixture for this. And now we come to the stars of the show - the Chef Recommendations - six premium dishes limited to one order per table. But fret not, the dishes are not fixed size portions. The size will be scaled according to number of diners at the table. U.S. Kurobuta Pork. Lightly seared and braised in dark soy. Brad fell in love with this. The pork is so tender, it's unreal. You'll want to enjoy this in silent reverence. 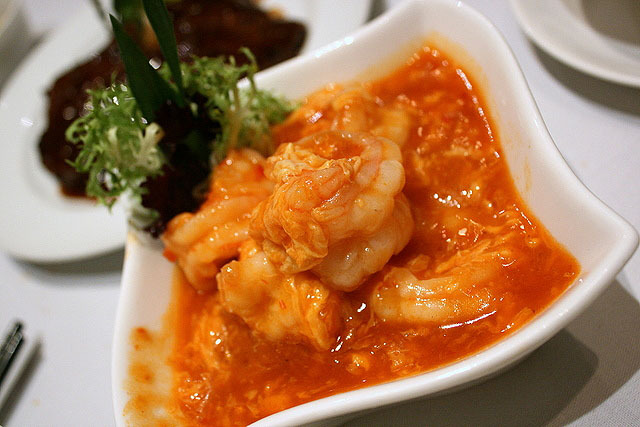 If you like chili crab but hate the hassle of dealing with the crustacean, why not try Chili Prawns - all shelled and ready to eat! The gravy is delicious. 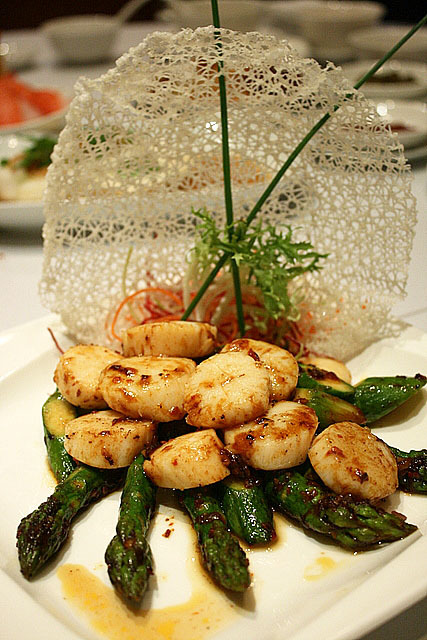 Scallop and Asparagus with Spicy XO Sauce. Wan Hao's presentation is remarkable. The scallops tasted sublime, and the asparagus done just right, still fresh and crunchy. Black Pepper Beef Tenderloin. 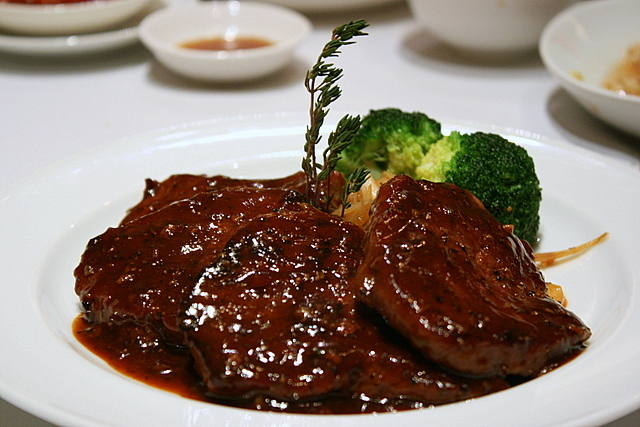 Again, unusually tender beef, coated with a robust black pepper sauce. Sea Perch Fillet with Garlic. These tasted so much like cod. 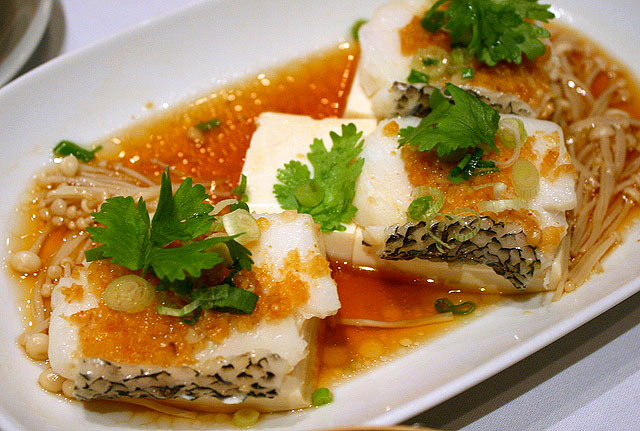 I loved the light, clean taste of the sauce, and how the garlic enhanced the taste of the fish. Drunken Prawns. And golly, were they drunken! These boys would never pass a breathalyzer test - we could smell the alcohol on them! And that's some very tasty stock they're sitting in. 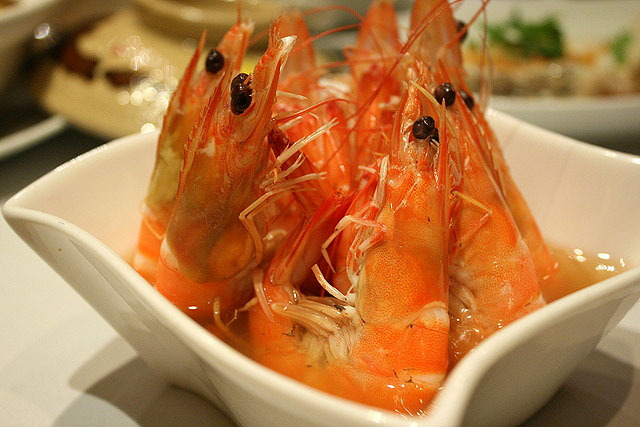 The prawns are incredibly fresh, as with many of the ingredients used in the dishes here. 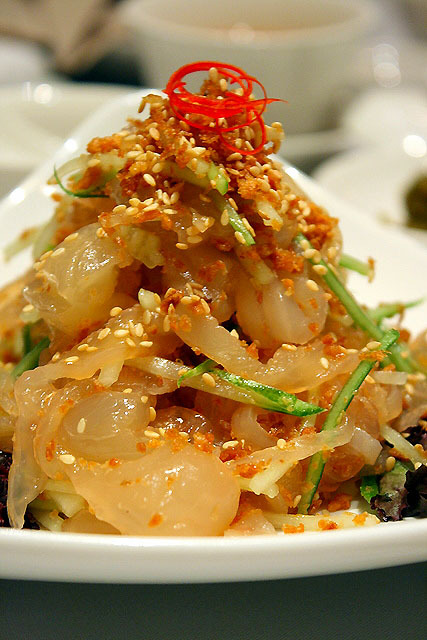 Restaurant manager Mr Song Cheng Wah says the hotel owner is extremely particular about freshness and quality. So it's a matter of fastidious pride that the restaurant serves the best in this respect. We tried almost all their desserts. Mini egg tarts (top left) done to flaky perfection. Herbal jelly (bottom left) done the traditional way. A truly exquisite mango pudding (centre) with real bits of mango. And lemongrass jelly with lime sherbet (right), clearly a modern addition. Eight Treasure Hashima. Wow, unlimited hashima? I'm sold! This was a lovely dessert, clear and refreshing without being too sweet. Again, Mr Song says they want to offer premium ingredients and good value. The brunch was put together after quite a bit of field research on other buffets at Chinese restaurants. Man, I'd like to have that kind of job! 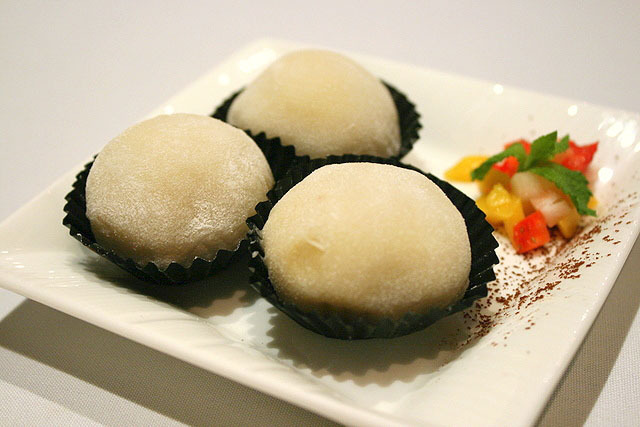 Durian Mochi. A novel way of presenting durian without its smell (which not all diners may appreciate). Pop one of these into your mouth and luscious durian will melt its way through the thin, chewy mochi skin. 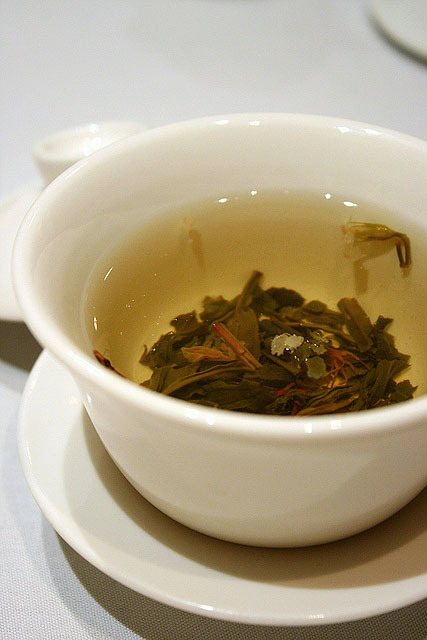 Wash it all down with some good Chinese tea. 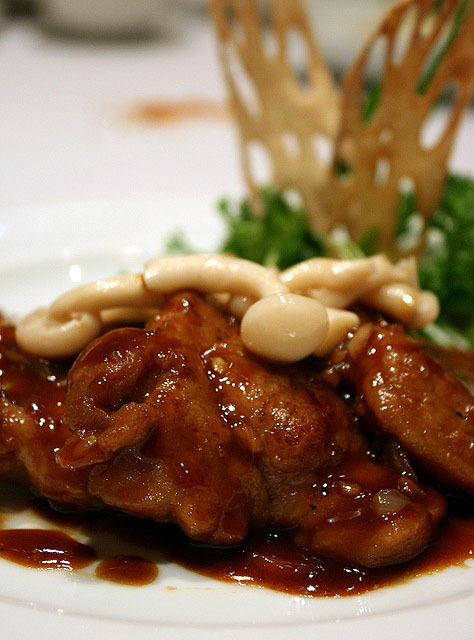 It will make you forget all the grease and cleanse your palate for more food! For what it offers, the Wan Hao weekend brunch is a steal at $55.00++ (adult) and $30.00++ (child). Note that there are two seatings: 11.00am to 1.00pm or 1.00pm to 3.00pm. I nearly made a reservation for that very weekend itself, but held back knowing the dim sum overdose I was going to have. Big thanks to Grace and Myra from the marketing communications team, as well as Mr Song for their warm-hearted hospitality. Thanks also to Jackson of Cuisine & Wine Asia for organising this. We enjoyed the session very much. oh wow that spread looks awesome.. I just drooled all over my keyboard. 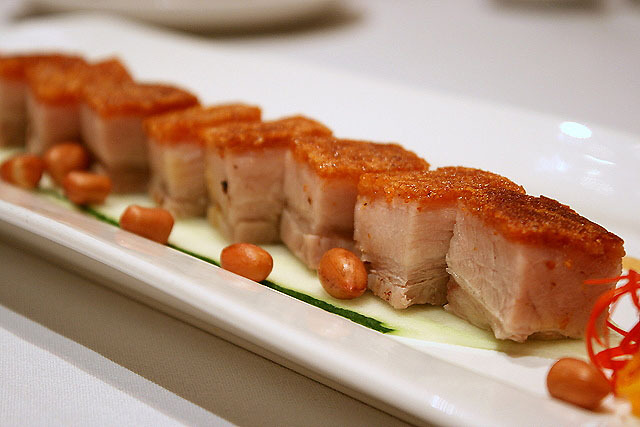 Everything looks soo good, especially the crispy skinned pork belly. The thin distribution of fats separating the layers of meat and the skin I can imagine would make each piece soo tender, paired with the pork crackling is droolworthy. I wouldn't know where to begin with all that food, but I would probably go for the duck spring rolls first - they look delicious! Ahh..so this was what I had missed. Btw kinda odd for sashimi in a dim sum tasting, no? i'm sorry i beg to differ. you did a great job with the pictures but the it's just overly flattering to the food that's actually served there. i was just at the place today and what i was served was really mediocre. the roast pork just isn't crispy or tasty enough (abt food court standard) too much fat too. roast duck had soggy skin. dim sum was vv mediocre - the har gau's skin was already stiff. the pork and beef overly tenderised. prawns and scallop really just average. the sea pearch bland.. i cld go on. but basically i'd avoid this place with a 10 foot pole and spend my money at lei garden, CJP or peach garden. for 55 bucks pax! it's a ripoff. Katie: haha, that would not be a bad choice! LIC: let's get a gang together and go! HungryCow: actually no. Quite a few restaurants give sashimi as well, notably Tung Lok ones. Momo: let's go with LIC! p: thank you for the feedback. it sounds like the kitchen was harried and churned out average fare? or maybe my experience was just supercharged by adrenalin. anyhow, I will likely revisit this place on my own and see if it's the same quality. Heard theres a weekday 1-for-1 promotion now till July from Mon to Wed.
Any idea whats the time period?